Minister for Transport, Tourism and Sport Shane Ross T.D. today asked people up and down the country to be ready to “get on their bikes” in advance of National Bike Week which will take place from June 9th to June 17th this year. Minister Ross said; “The benefits to be gained from cycling are immense. They include improved health, reduced traffic congestion, better air quality, improved accessibility to transport, and reduced costs. Cycling is a fantastic way to get from A to B, to enjoy the countryside or just to get some air and exercise. It will benefit all of us if we can increase the number of cyclists on our roads while keeping them safe. For that reason I secured €110 million capital funding in Budget 2018 for cycling and walking infrastructure in Dublin, Limerick, Galway and Waterford over the next four years as well as committing €55 million to Greenways nationwide. 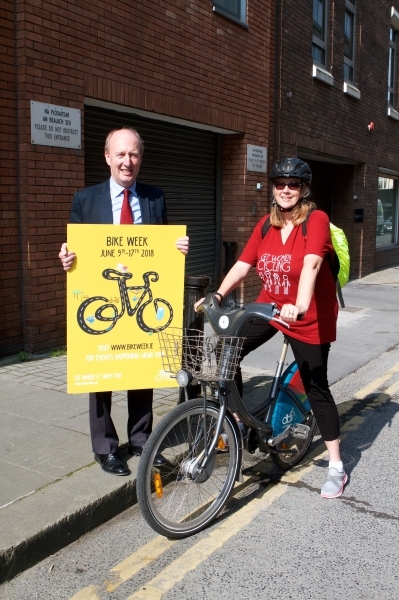 Minister Ross noted that Bike Week is a celebration and promotion of all that’s great about bikes and cycling saying; “I urge people to check out the range of bike themed events which are organised by local authorities, community groups and cycling groups all over the country. If you’re a cyclist already, this is a great week to celebrate that fact, and if you aren’t it’s the perfect time to get started”. In addition the Minister plans to “work closely with DCC who will host Velo-City and welcome the conference, delegates and sponsors back to Dublin in June 2019”.